It's barely December, yet it's already the holiday-giving season with top prospects. Justus Sheffield, Jarred Kelenic and Justin Dunn have found new homes -- all in Seattle -- after moving from the two New York organizations, and there are surely more deals on the way. The size of these trades is yet to be seen, but if the recent past is any indicator, we could be in for a wild ride. Perhaps how these deals look in retrospect could teach us all something about how we view prospect-heavy trades. During the middle of this decade, Arizona had a penchant for dealing recent first-rounders to Atlanta. Six months before this swap, the D-backs essentially sold 2014 16th overall pick Touki Toussaint to the Braves, giving up Bronson Arroyo's contract in the process for a modest return in Phil Gosselin. The following winter, the club tested the Trea Turner Rule by moving 2015 top pick Swanson in a deal for a controllable and affordable starting pitcher in Miller. While other sports may have a history of trades involving the No. 1 overall selection, it's almost unheard of in baseball, and it's not like Swanson's stock had dropped since Rob Manfred announced his name the previous June. The shortstop was MLB.com's No. 10 overall prospect at the time of the deal, and as if that wasn't enough, Arizona also included MLB.com's No. 61 overall prospect at the time (Blair) and a Major League outfielder (Inciarte). Swanson hasn't quite lived up to the hype in his first two Major League seasons, but it's worth noting Miller was just non-tendered by Arizona after three injury-riddled seasons. In July 2011, the Astros were about to begin a string of four straight 50-win seasons, while the Phillies were on the cusp of winning more than 100 games for the first time since 1977. Rarely was there such a strong matchup of a club looking to rebuild and another willing to put all its chips on the table. Cosart and Singleton became Houston's top two prospects at No. 31 and 32 overall. Cosart was lauded for his plus fastball and plus curve, while Singleton had shown good hit and power tools at first base. Santana also moved into Houston's top 10 and has had easily the most productive Major League career of the four prospects involved. While the deal was massive at the time, none of the four helped Houston's run to prominence, and none remain in the organization following Singleton's release last May. It's still too early to judge this one, but there's no doubting the significance of this swap between Chicago's two clubs ahead of the 2017 trade deadline. Quintana was rumored to be on the trading block as the White Sox began their own rebuild, kickstarted by other deals further down this list. General manager Rick Hahn held onto the controllable left-hander until he got a prime package in return from Theo Epstein & Co. during the season. Jiménez was ranked as the No. 5 overall prospect at the time of the swap because of his incredible hit and power tools. (Not much has changed in either department.) Cease had yet to truly break out but was still slotted at No. 58 overall because of the elite velocity and promising curve. By season's end, the pair would rank at No. 1 and No. 5 in the system. The Cubs picked up Quintana's $10.5 million option for 2019 and have another one for the 2020 season as well, so with neither major prospect reaching the Majors yet, it'll be a while before this trade can be fully assessed. Lee -- no stranger to prospect trades after he was shipped from the Expos for Bartolo Colon in 2002 -- would move around quite a bit in 2009 and 2010 with deals to the Mariners and Rangers following this transaction. Of the bunch, though, this July 2009 swap was easily the most prospect-heavy. All four of the prospects involved would feature in Baseball America's top-100 list at some point either before the 2009 or 2010 seasons; Carrasco, Marson and Donald ranked 52, 66 and 69 before 2009, while Knapp ranked 64th the following year. (MLB.com didn't rank prospects then.) It was quite the haul for Cleveland, which had been building its own farm around Carlos Santana, Matt LaPorta and Lonnie Chisenhall. Despite the considerable depth the quartet brought, only Carrasco leaves a lasting legacy in Cleveland. Still, the Tribe have gladly welcomed the right-hander as a rotation stalwart in the decade since the deal, and because of that, it's a deal the club would do again. It's been a while since the Rangers system was as loaded as it was in July 2015, and Texas dipped into that strength when it sent a bevy of young names to the Phillies for a then-three-time All-Star in Hamels. Thompson, Williams and Alfaro were all ranked among MLB.com's top 100 at the time of the deal, checking in at Nos. 51, 55 and 59 by the end of the season. Only J.P. Crawford (No. 5) and Mark Appel (No. 43) ranked higher among Phillies prospects. Asher, Eickhoff and Harrison added three Major League-ready arms to the package. Williams and Alfaro remain with the Phils but aren't yet the stars the club hoped it was getting. Thompson was designated for assignment in August and is now a free agent after a brief spell with the Brewers. He finished with a 4.87 ERA in 116 1/3 innings with Philadelphia. Since they took him with the 16th overall pick in the 2012 Draft -- even after he had already undergone Tommy John surgery -- the Nationals' most prized prospect was Giolito. Yet after five seasons in the organization (and six appearances with the Major League club), Giolito ended up being the centerpiece in the December 2016 deal that brought back Adam Eaton, who was potentially under team control through the 2021 season. Giolito -- then the No. 3 overall prospect in the game -- may have been the headliner, but No. 38 overall prospect Lopez and 2016 first-rounder Dunning were no slouches either. After the deal, Victor Robles and Erick Fedde were the only top-100 prospects left in the Nats system. Giolito and Lopez have been given plenty of room to breathe in the bigs in a South Side rebuild, with middling results, while Dunning currently sits at No. 59 overall. Eaton has experienced injury issues during his two seasons in the nation's capital but is poised to be the most tenured member of the Nats outfield if the club doesn't bring back free agent Bryce Harper. Halladay had felt like a Blue Jay-for-life candidate. However, Toronto hadn't made the playoffs in any of his 12 Major League seasons with the club, and it was clear the 32-year-old right-hander would need to go elsewhere to see the postseason. That elsewhere was Philadelphia as the Phillies sent three prime prospects in right-hander Drabek, outfielder Taylor and catcher d'Arnaud in December 2009. Drabek would enter the next season as Baseball America's No. 25 overall prospect, while Taylor and d'Arnaud checked in at No. 29 and 81. Though it doesn't count toward this transaction, the deal got even heavier from a prospect standpoint when the Jays flipped Taylor for Brett Wallace, who would be BA's No. 27 overall prospect the following spring. The biggest contribution the group may have made, however, was when d'Arnaud, along with Noah Syndergaard, helped bring R.A. Dickey to Toronto three years later. While with the Phillies, Halladay would win the 2010 NL Cy Young award, toss a no-hitter in his first playoff appearance and shore up a likely Hall of Fame career. Remember when the Royals were going for it? In December 2012, Kansas City was coming off its ninth consecutive losing season, but with Alex Gordon, Mike Moustakas, Eric Hosmer, Salvador Perez and Lorenzo Cain all arriving on the scene, the club was on the cusp of something big. The only thing missing was a front-line starter. So the Royals went out and got one in Shields and added pitching depth with Davis, who they said at the time would be a starter despite having his most promising season come from the bullpen the year prior. The price was big. Kansas City gave up the next wave of young talent in No. 3 overall prospect Myers, No. 30 overall prospect Odorizzi and Montgomery, the sixth-ranked prospect in the organization. This was the only trade in the past decade in which a top-five overall prospect was paired with a top-30 prospect. As if his ranking wasn't enough, Myers was clearly Major League-ready as well, coming off a 2012 season in which he'd hit .314/.387/.600 with 37 homers at Double-A and Triple-A. He would win the 2013 AL Rookie of the Year award but would last only two seasons in Tampa Bay before heading to San Diego in the Turner deal. Odorizzi played five seasons with the Rays before moving onto the Twins. Montgomery never cracked the Majors with Tampa Bay but has pitched for the Mariners and Cubs. Shields would spend two seasons in Kansas City, helping the club reach the World Series in 2014, while Davis helped the club seal the deal a year later. This was quite literally unprecedented. 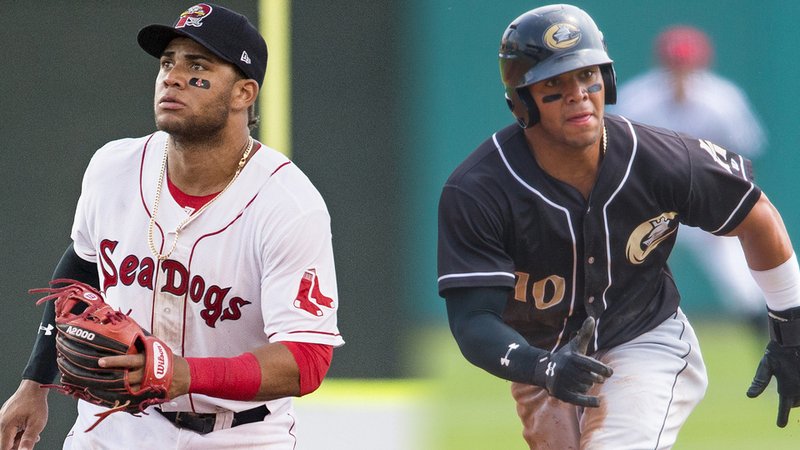 Moncada was the top overall prospect in the game entering the 2016 Winter Meetings in National Harbor, Maryland. If there seemed an untouchable prospect in baseball, it was the switch-hitting infielder with above-average power, plus speed, a good hit tool and a good arm. Instead, he switched Sox. Boston dealt the 21-year-old for perennial Cy Young contender Sale, who was under team control for three more seasons. Moncada became the only No. 1 overall prospect traded in the last 25 years. The lanky left-hander also cost Boston Kopech -- MLB.com's No. 67 overall prospect known for his triple-digit fastball and plus slider -- and a toolsy outfielder in Basabe. Kopech might end up being the biggest name traded, should he return to form after Tommy John surgery, but on the prospect side, this deal will be remembered for redefining "untouchable."